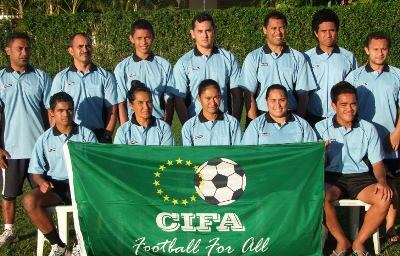 The uniform set was bought at a discounted price through the Cook Islands Football Association (CIFA) with all the match officials and assistant officials rave about their new look for the 2012 season. A dedication ceremony took place at the CIFA academy of the full set of equipment which includes shirts, shorts, socks and flags. Referee coordinator and chairman Lai Gukisuva is grateful to CIFA and Lotto Score Sportswear for the new equipment and will put in to good use throughout the football which will kick off next week. “I believe that our match officials will not only look smart but will put what they have been taught into practice once the season kicks off”, says Gukisuva. Following a referee course run by the FIFA Referee Assistance Program (RAP) team which took place in July, Gukisuva along with his committee is confident that all twenty three participants who attended the course will execute their duties to the best of their capabilities. “I am also excited to welcome the several new enthusiast youths who have taken on the challenge of refereeing this year, no doubt they will have their sights set on refereeing for a long while to come”, he says. Preparations for the season took place following the course both on and off the field and a little boost of new the gears will certainly see the match officials look smart and to officiate the game with confidence.